A sebsi or sibsi (Arabic: سبسي‎, plural: sbasa) is a traditional Moroccan cannabis pipe with a narrow clay bowl called a skuff (or shkaff), with a fine metal screen. 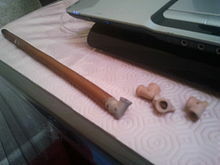 To this a hardwood stem is attached, which may be up to 46 cm (18 in) long. The sebsi is used to smoke kief (cannabis trichomes) or mixtures of cannabis with tobacco or other herbs. The sebsi provides a small, low-temperature serving of herb (usually about 25 mg), compared with larger traditional smoking devices like the chillum of India and Jamaica. ^ Maverick Guide to Morocco. Pelican Publishing. pp. 84–. ISBN 978-1-4556-0864-5. ^ 2006 World Drug Report: Analysis. United Nations Publications. 1 January 2006. pp. 2120–. ISBN 978-92-1-148214-0.